I’ve been trying hard to make the case for my team to transition over to using QGIS instead of ArcGIS, but to do that I need to come up with a compatible work flow process that would make the transition from ArcGIS to QGIS as smoothly as possible. I find the hardest part in the work flow process of transitioning from ArcGIS to QGIS is getting ArcGIS-like symbology in QGIS. The nice thing I like about ArcGIS is that it has a lot of symbology sets that comes packaged with the software so you don’t spend lots of time creating them - you can easily make a map with all sorts of industry standard symbols. Anyway, here are some of my thoughts, tips, and working process for getting/creating symbology into QGIS. I find that when pulling in an ArcGIS WFS or Geoservice into QGIS, it will retain the symbology set by the WFS or Geoservice. Although I’m not sure if this hold true for OGC WFS layers – or at least it didn’t work when I tried it using OGC WFS from both a GeoServer and ArcGIS OGC WFS (see example further down in the post). For this example, I’m using data from the Hawaii Statewide GIS Geoportal site. I use data from the State’s GIS portal and the City and County of Honolulu’s site a lot. These services already have symbology that they’ve defined so I don’t have to recreate them if not necessary. Note: Alternatively, if you know the link to the file-base ArcGIS REST service (e.g. http://geodata.hawaii.gov/arcgis/rest/services/ParcelsZoning/MapServer) you can just use that link. But since many organizations are using Geoportal to serve their data that is what I’m going to show in this example. 3. 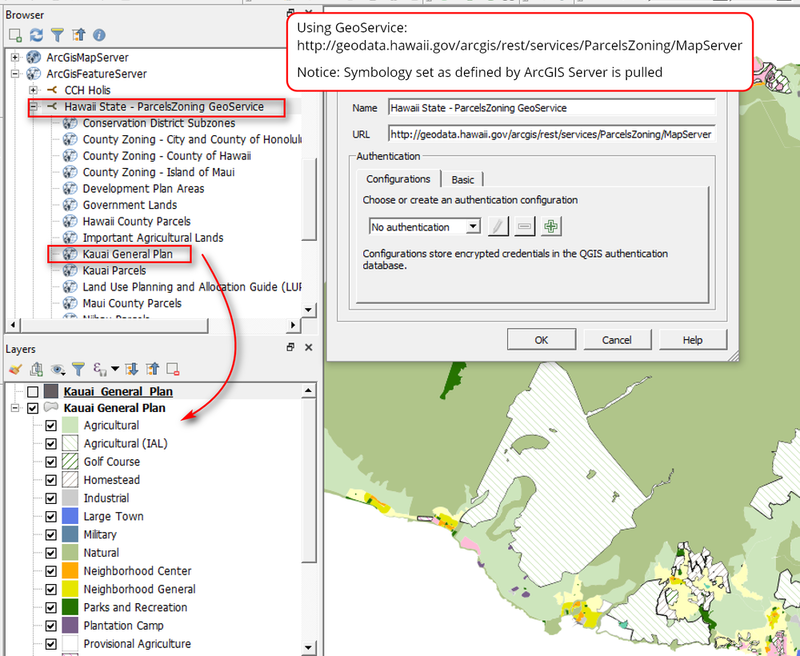 QGIS, Add in the ArcGISFeatureServer Connection. The GeoService that you copied will be something like this: http://geodata.hawaii.gov/arcgis/rest/services/ParcelsZoning/MapServer/7/query?outFields=*&where=1%3D1. But you’ll want to only keep the text up until “…MapServer” and remove everything else after it. Otherwise you won’t be able to see anything layers when you add in the service. 4. Expand the newly added service in the Browser Panel, double click on a layer to add to Layers Panel for viewing. Here I added Kauai General Plan layer. Comparisons of the ArcGIS WFS layer view in ArcGIS and QGIS. Notice that the symbology as defined by the ArcGIS WFS pulls nicely into QGIS. The symbology sets in QGIS and ArcMap look very similar – the solid color symbols are the same except the hatched symbols looks slightly different. You’ll need to manually fix the hatched symbols in QGIS if you want to look the same as ArcGIS. 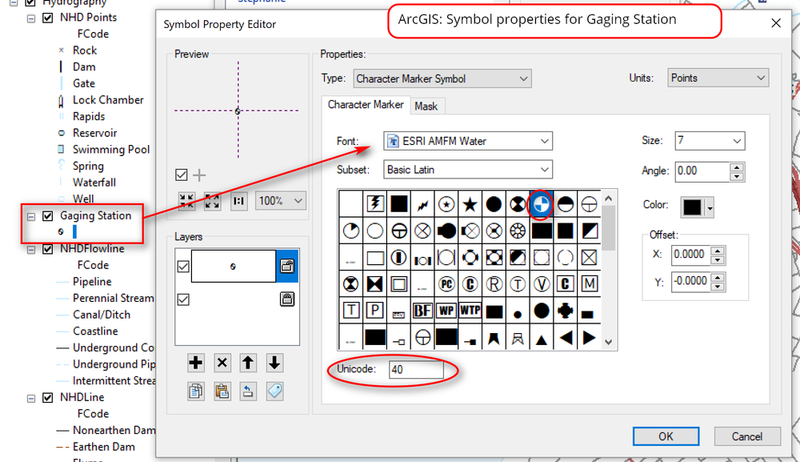 I have access to ArcGIS so I use it to see what the symbol info are then I use this same info to for the symbol in QGIS. Here, I’m changing the hatched symbol for Provisional Resort (magenta hatched symbol) in QGIS. I take note of the symbol properties in ArcGIS then I use the same info for the symbol in QGIS. So, in QGIS the symbol for Provisional Resort comes in as a simple fill, which looks like the symbol used in ArcGIS but when the map is printed or exported to pdf, it doesn’t produce the effect I want; a hatched line polygon with transparent background. So in QGIS, the simple fill should be changed to a line pattern fill symbol. This the symbol properties in QGIS - which needs to match what is seen in ArcGIS above. Here is a comparison look at the symbology in ArcGIS and QGIS - this is after I made changes to the hatched symbols in QGIS to match ArcGIS. QML files save style information including labels from a layer if you have them. It doesn’t contain reference to the layer source. You can use a qml file on your own copy of the dataset. QML files can only be applied to a layer once it has already added to QGIS. To use QML files you need to add the data layer first to QGIS then Load Style for the layer. It works for shapefiles, OGC WFS layers, and feature classes from a file GDB (I’ve tested on my machine and it should work but can’t guarantee). TIP: if you have a shapefile and *qml file saved in the same location with the same layer name then QGIS will automatically use the corresponding qml style as the default for the shapefile. 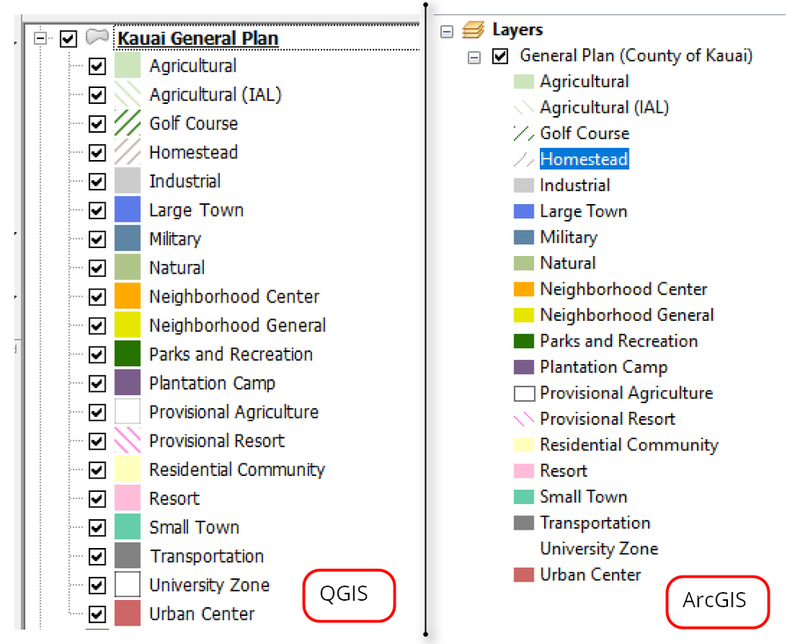 Here is an example of applying qml file to an OGC WFS layer – if you remember from above the OGS WFS layer for General Plan Kauai County was pulled into QGIS with only 1 symbol/style. Since I’m talking about creating or rather re-creating ArcGIS-like symbology for use in QGIS. Here is a bonus. I really like the USGS TNM maps for references and use the USGS TNM Style Template in ArcGIS at lot – see the ArcGIS Template (map document or mxd file) provided by USGS - See post here for background. But there’s no equivalent for QGIS. So, here I try to recreate the styles for use in QGIS. I haven’t worked on the labeling yet. I could use the USGS TNM WMS service in QGIS but it doesn’t provide the high resolution I need, so I’d rather use the vector dataset. Also it gives me more control on what features I show and how I symbolize them. This workflow requires having access to both ArcGIS and QGIS and basically is comparing and translating the symbol property information from ArcGIS to QGIS. It is time consuming but worth it to get something decent for use in QGIS. Below is the workflow process I used – it is still a work in progress. I’m using the Honolulu 7.5 minute quad as an example here. Also note I’m directly accessing the GDB in QGIS. Optional - In ArcGIS, I run a python script to get list of Domains for the USGS Vector GDB. Think as Domains as basically coded look up tables in the GDB, and I use this for reference to help me recreate the symbology in QGIS. There are also subtypes in the USGS GDB as well, but I didn’t bother to get these listings. 2. Open USGS TNM style template (e.g. TopoTNMStyleTemplate_v10_01.mxd) in ArcGIS set the data source link to the staged vector GDB of interest (I’m using VECTOR_Honolulu_HI_7_5_Min_GDB.gdb). 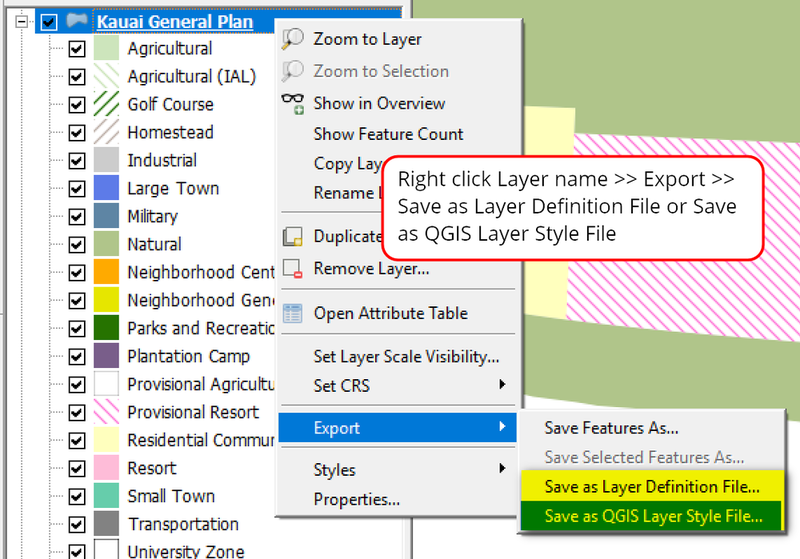 Below is an example for the Structures layer as categorized in ArcGIS. Here is the same example of the Structures layer by categories or rule-based categories in QGIS. Tip: For symbols that use ESRI Fonts, I try to use the same font symbol in QGIS, since I have ArcGIS installed on my machine – see snapshot below. But this may not work if you don’t have access to ArcGIS. Here’s what it looks like in QGIS. I think it looks pretty good. Creating a QGIS project template is as easy as saving the QGIS project as a *.qgs file and putting it into the QGIS Project Templates folder. 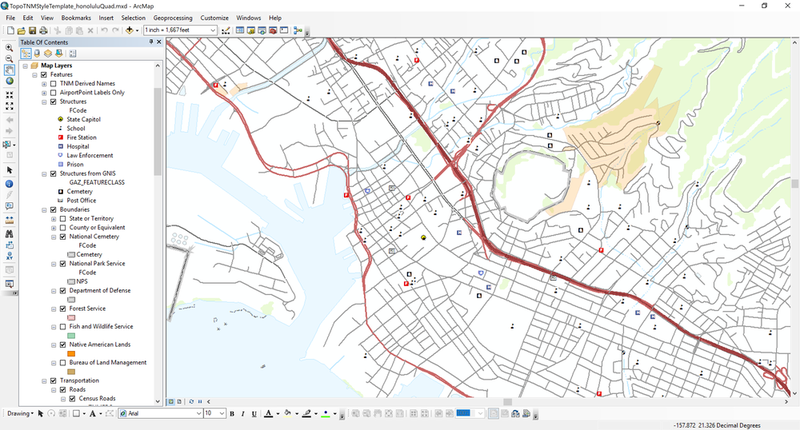 So, that’s what I did - saved my QGIS USGS TNM Style map as a QGIS template. QGIS 3.x saves the project to the default .qgz file so I do a “Save As” to are non-compressed QGIS project file .qgs file. Then I copy and paste the *qgs file into the QGIS Project Templates folder (e.g. C:\Users\Stephanie\AppData\Roaming\QGIS\QGIS3\profiles\default\project_templates). To change the project template file to use a different dataset, just open the *.qgs file that is in the Project_Templates folder (e.g. C:\Users\Stephanie\AppData\Roaming\QGIS\QGIS3\profiles\default\project_templates) in a text editor (e.g. Notepad++) and find the old data path and replace with your new data path - see example below. Save this file when done. For my example, I downloaded a USGS Vector GDB file for San Rafael, CA quad (e.g. VECTOR_San_Rafael_CA_7_5_Min_GDB.gdb). You can download the staged USGS vector datasets directly by State from here. After opening the file, it should look like the following. If you don’t see anything on your map, you may need to zoom in to a layer (i.e. click on a layer >> Zoom to Layer). The snapshot below shows the San Rafael, CA topo quad. Note, also you’ll need to change “Hawaiian Homelands” layername to Native American Lands. Also, some layers may not contain any data if they are not available for that particular quad. Here is what the USGSTNMTemplateQGIS3_Draft QGIS project template file opened with San Rafael GDB applied. Note that I’ve included a USGS WMS for shaded relief and imagery in the template. Bonus Tip: Trick to getting a WMS or WFS to show up in a Print Layout - you may need to have all layers in the same coordinate system (CRS). WMS and WFS are usually in CRS 4326, so try re-projecting your data layers into the same CRS if they are in a different CRS. QGIS can do projection-on-the-fly so you can see all layers in different CRS in the map view but not in print layouts. A copy of the QML files and QGIS project files can be downloaded from my GitHub page if you want to see if the styles will work for you with your own dataset. Access to both ArcGIS and QGIS may be needed for the style files to work properly in QGIS.I have ArcGIS 10.6.1 and QGIS 3.4.3 installed on my machine when I created the QML files, so I'm not sure if it will work in QGIS if you don’t have access to ArcGIS. The QGIS project file, USGSTNM_Template_QGIS3_Draft.qgs can be use as a Project Template file. Copy this file into the project_templates folder (e.g. C:\Users\Stephanie\AppData\Roaming\QGIS\QGIS3\profiles\default\project_templates). Then open this qgs file in a text editor and find/replace old data path with new data path (e.g. your own GDB). See the blog post for reference on how to do this. If using the QML files individually, please read the note below. Notes on QML files for filtered data layers: The QML files that contain filtered data may not pull in the queries used, so you may need to apply the queries below for these layers. Right click on the layername >> Properties >> Source >> Provider Feature Filter.